Laboratoire Matière et Systèmes Complexes - Séminaire exceptionnel MSC. 05 juin 2018. Shreyas Mandre (Brown University, USA) : "Axisymmetric spreading of surfactant from a point source"
Accueil du site > Séminaires > Archives séminaires > Séminaires 2018 > Séminaire exceptionnel MSC. 05 juin 2018. Shreyas Mandre (Brown University, USA) : "Axisymmetric spreading of surfactant from a point source". Warning : exceptional schedule. Tuesday 5 June 11h30 in room 454A. Axisymmetric spreading of surfactant from a point source. Shreyas Mandre, Assistant Professor, School of Engineering Brown University, RI, USA. Abstract : A surfactant, e.g. soap, is a chemical compound that adsorbs onto a fluid-fluid interface and reduces its surface tension. A non-uniform distribution of such compounds at the interface causes a Marangoni stress that drives a flow, which in turn transports the surfactant. 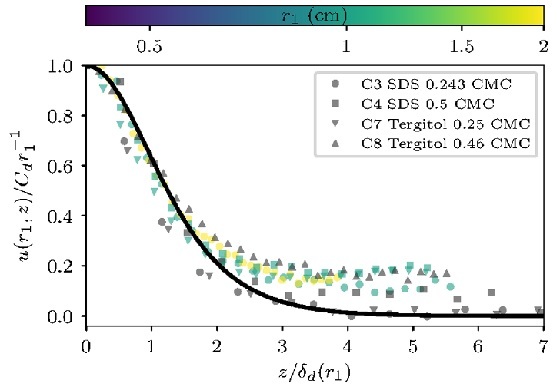 Estimating in situ the degree to which the adsorbed surfactant is out of equilibrium with the dissolved state is critical but challenging, especially because of the multiple length- and time-scales the surfactant and flow dynamics span. An epitome of such a system is the axisymmetric flow driven by a steady point source of surfactant on the surface of a deep liquid pool. In this case, the state of the surfactant is difficult to gauge, without which even simple order-of-magnitude scaling theories remain incomplete. In this presentation, I show that combining scale invariance of the governing mathematical model with experimental velocimetry can furnish a near-complete description of the dynamics. The nature of surfactant dynamics can be deduced by examining three invariant characteristics of the flow, and without knowledge of the surfactant physicochemical parameters.